This was a cracking read. I sat up far too long trying to finish it and find out what happened. It’s tautly plotted, has an excellent horsey background, and had me holding my breath as the denouement approached. If you like heart-in-mouth stuff, with strong, attractive characters, download this book: you really don't have anything to lose, because it's free. Just when you think you have a reasonable idea about an author, something pops up which makes you rethink. I've included Mary Gervaise in my book, Heroines on Horseback, and have recently written about her too. What I didn't know, until it turned up in a load of books I bought this week, was that she was a very early exponent of the girl plus pony story. In 1932, when The Twins in the Third was written, pony stories were generally stories told by the pony, and they weren't exactly numerous, being far outnumbered by the school story. Spring has sprung, even right next to the A14. Warm enough at last for dogs to swim. This post actually appeared as a comment on my post on 1970s pony literature. I enjoyed it so much I felt it was a shame it was buried in the comments. It deserves to be read, so here it is, and many thanks to Laura for writing it. I hope you don't mind being moved to a starring role! I'm now a university lecturer in English Literature, though struggled with reading from about the age of 9 through to 13. Patricia Leitch's books kept me reading and thinking during that time and, most importantly, they kept alive in me the notion of a life of the imagination. The book that I loved most was Dream of Fair Horses, which I still reread.... it is really a book about what it means to have relationships that aren't driven by possessiveness. There were bits of my book which ended up on the cutting room floor, and some of them I was quite fond of. Mary Gervaise was one author whose section was cut quite considerably. Anyone read pony books in the 1970s will remember the Armada paperbacks of her Georgia series, with photographic covers, and rather alarming bright blue spines. 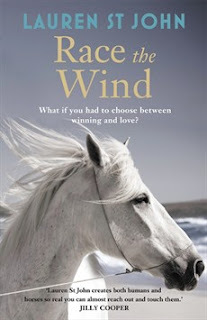 Race the Wind is the second in the Casey Blue series. In the much grittier first book, Casey is living in East London, in grinding poverty. She buys a horse for an American dollar (the only money she has is the sort useless in London) and after many trials, wins Badminton at the age of 17. I was looking through the children’s books in our local Waterstone’s recently, and found a series of truly epic awfulness: the publishers of Holly Webb’s Animal Stories series have moved on from merely brandishing huge-eyed cuteness at the infant reader to straightforward manipulation of their emotions: how about these for titles? Harry the Homeless Puppy, Alfie All Alone, Lost in the Snow, The Kitten Nobody Wanted, Alone in the Night..... The series, according to the publishers, Scholastic, “realistically describes the range of emotions animals and their people feel when they are separated.” Which is fair enough, but do you really need 24 different variations on misery, albeit misery which is overcome, to make the point? When you see the books gathered together on the shelf, it’s even worse: a solid concatenation of animal melancholy. We're getting used to living in Kettering. Actually, I like it here. Having been to school here, I would never have believed you if you'd told me I would, but I do. I like being able to walk pretty well everywhere I need to go, instead of getting the car out the whole time. I like the large library at the top of the road, with its attached art gallery, and the café opposite. I've found bits of the town I never knew existed.